Allen Bradley 2711P-T6C20A Ser D PanelView Plus 600 HMI Perfect Touchscreen 2011. Condition is Used. Shipped with USPS Priority Mail. the screen looks a little dirty but it is for the use, it is only the protective plastic. the touch screen works perfect and the screen is not broken. Be missing the power connector. The PanelView Plus 600 displays are grayscale (320 x 240) or color with either keypad, analog touch screen or keypad/touch screen input. Rockwell Automation > PLC & HMI > Operator Interfaces > PanelView Plus > 2711P-T6C20D/D. Panelview Plus 600. LOC 22B3-36. W/ 2711P-RN1 Remote I/O Module. Model: PanelView Plus 600. Allen Bradley Operator Interface. Panelview Plus Compact 600. Allen Bradley. Trending at $551.66eBay determines this price through a machine learned model of the product's sale prices within the last 90 days. 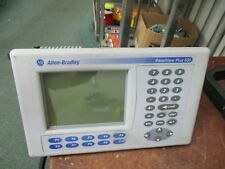 Allen Bradley Panelview Plus 600 2711P-T6C3A Touchscreen. Allen Bradley. This item is Allen Bradley 2711P-T6C20D8 New in box with good quality. 1x Allen Bradley 2711P-T6C20D8. Laptop Power Jack Board. new arrival. Cellphone Parts. Server Parts & HDD Caddy/Tray. DHL(0.5KG/Add weight)USA MX CA ITA/DE/FRA/UK/ES/GRE. Part number:2711P-T6C21D8S. ---Lower price. ORIGINAL & NEW FACTORY SEALED PARTS. ---Less doubt. Send picture before sending parcel. All project components provider. Qty ( 1 ) Allen Bradley Panelview Plus Compact 600 ( p/n 2711PC-T6C20D Ser D ). Physical Condition: Item is in clean condition. Item is scuffed on the left side of the front face. Functional Condition: Item powers on and displays as shown. Good Condition Allen Bradley Panelview Plus 600 2711P-B6C20A SER B REV A 100-240VAC. Allen Bradley PANELVIEW PLUS 600 CATALOG 2711P-T6C20D8. Box opened for verification and picture purposes only. Panelview Plus 600. Allen Bradley. Rockwell Automation > PLC & HMI > Operator Interfaces > PanelView Plus > 2711P-B6C20A/A. As PLC Hardware is not an Authorized Distributor of the products,manufacturer's warranties may not apply. All listed logos, trademarks or service marks are property of their respective owners. PanelView Plus DH Communications Module. Allen Bradley 2711P-RN8 2008 Date. Open and honest two-way communication is the key. Local Pick Up: Local Pick Up is available (unless otherwise indicated). Location: Darien, IL. Rockwell Automation > PLC & HMI > Operator Interfaces > PanelView Plus > 2711P-T6C20D8/A. As PLC Hardware is not an Authorized Distributor of the products,manufacturer's warranties may not apply. All listed logos, trademarks or service marks are property of their respective owners. (See details below). Condition: New/Unused Surplus in original box. NOTE All drives must to be connected to power for at least 4 hours prior to operation. If this action is not taken, it can ruin the drive. Be sure to add us to your favorites list ! We will make every attempt to make things right. Rockwell Automation > PLC & HMI > Operator Interfaces > PanelView Plus > 2711P-T6C5D/D. As PLC Hardware is not an Authorized Distributor of the products,manufacturer's warranties may not apply. All listed logos, trademarks or service marks are property of their respective owners.